Whether you are a homeowner looking to cultivate a vegetable patch, or a landscaper expanding your business, a Two Wheel Tractor combines huge versatility with great performance and reliability. Thanks to their handling and ease of use, our Two-Wheel Tractors are fantastic for a vast range of users: from hobby gardeners to professional farmers. Two-wheel tractors are perfectly suited to working soil, gardens' care, greens maintenance and mowing - and can carry out tasks that don’t suit four-wheel tractors including mowing slopes, maneuvering in small areas and intensive cultivation. Our Two Wheeled Tractors boast great build quality, and an array of quality features, including an all-gear drive system and top-of-the-range engines. Handlebars are fully adjustable and reversible, ensuring the machines are comfortable to use - and allowing owners to easily transform their walk-behind tiller into a mower. Two Wheeled Tractors can be fitted with a massive range of implements, including scythe cutter bars, as well as disc, flail, mulching and rotary mowers; ploughs, a cultivator and potato lifter; even a chipper/shredder. 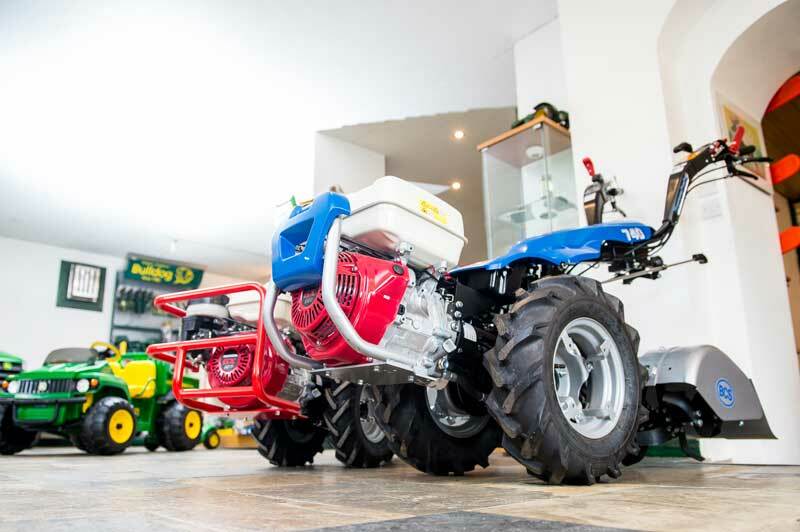 Pop by and see our range of Two-Wheel Tractors for yourself, or you can browse through our collection of equipment online.